Three houses from Cowell's beach, the Cowell Beach House offers the perfect location for anyone looking to be near it all. Steps to the Wharf, Main Beach, Cowell's Beach, the Boardwalk, Aquarius, Jack O'Neill Lounge, Steamer Lane, Lighthouse. 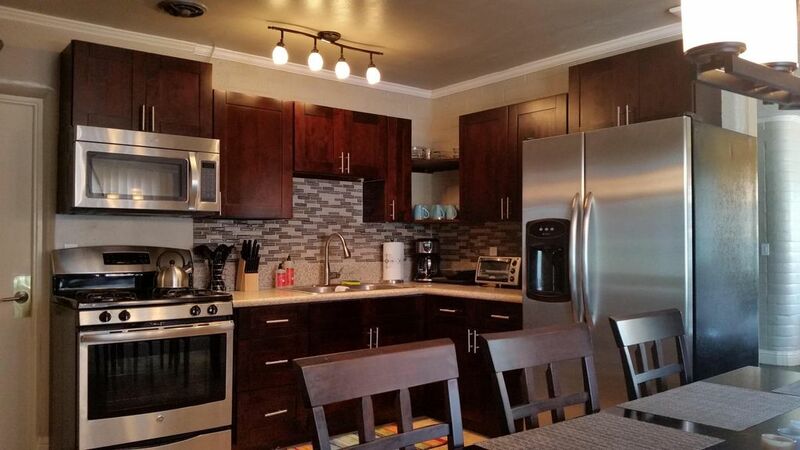 Our unique 2 bedroom, 1 bath duplex comes outfitted with with garage, washer/dryer, back yard, LCD TVs, Wifi, BBQ. Steps from the ocean. Ocean view from the driveway. Couch which also works as a sleeper sofa. Patio set with 6 seats with optional umbrella. Decomposed granite paving surrounded by bark and native Santa Cruz plantings. The Cowell Beach house property was such a perfect find! We loved this comfy, well-appointed home, just steps away from Santa Cruz's stunning West Cliff Drive and a short walk to the Wharf and boardwalk areas. It was so convenient for us, especially since we arrived without a car. We truly appreciated the care that was put into making the home beautiful and comfortable. Plus, Diana was incredibly welcoming and attentive to our needs; definitely a top-notch host! I can't wait to return to Santa Cruz, and this will be the first place I check when I do! Was just what was needed for a one night girl's getaway in San Cruz. Didn't use the kitchen other than some wine glasses and wine opener. Beds were not the greatest as others have commented in their reviews. But again, it was only one night. Great location and quiet neighborhood. Very nice place.. it’s spacious, well maintained and excellent location. I would book this again. Although this unit had a good location within walking distance to the beach and Santa Cruz Boardwalk, I would not stay here again. It was dark and depressing inside, and the dark floors and furniture did not help. The duplex is made from painted bricks which give a basement-like feel to the whole place. The unit was also cold even though I turned the heat up and used one of the electric heaters I found in the closet so I was uncomfortable, especially at night. As noted in other reviews, the beds are terrible, and I am an exceptionally small person who doesn't put much of a dent in the mattress, so for an average-sized person it would be a complete marshmallow. The cooking area of the kitchen is nice, but, overall, the place has a neglected feel with chipped and stained baseboards, cracked tile in the bathroom sink area, and a very unappealing shower with chipped, stained ceramic and tile. The unit definitely needs some TLC. The driveway and garage parking were helpful, and it was quiet as were the neighbors on the other side of the duplex. However, I can't give it a higher review and would not recommend this unit. This house had everything we needed. Comfortable and close to the beach. Great overall experience. Loved taking walks on west cliff! Our unit B is located in the beautiful and sought after lower West Side of Santa Cruz, this property is located 1/2 block from West Cliff Drive and Cowell's beach. Walking distance to the beach, the Wharf, Steamer Lane surf spot and the Santa Cruz Beach Boardwalk - no need to drive. Want to grab a drink and a bite to eat? The Aquarius and Jack O'Neill Lounge are literally around the corner. Contact us for information about additional rental units you may have available for your dates.